Last night, I catered and attended a rather impromptu little dinner party for a treasured friend and client. I feel so fortunate that I get to work with people I adore, and that oftentimes, I can surprise them with a menu that I know that they will love based on my past interactions. It’s the BEST; as a chef, I feel like *I* am truly involved in the hosting of the party. And I often come up with menus that I would serve at my own dinner parties! 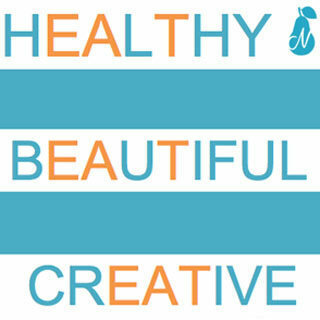 That allows me to put even more of my heart, presence, and creativity into the meal – a hugely important factor. 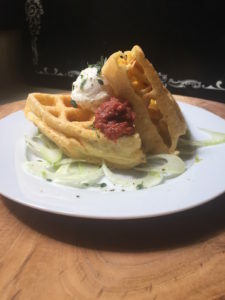 These hazelnut lace waffles came together with all of that and more! 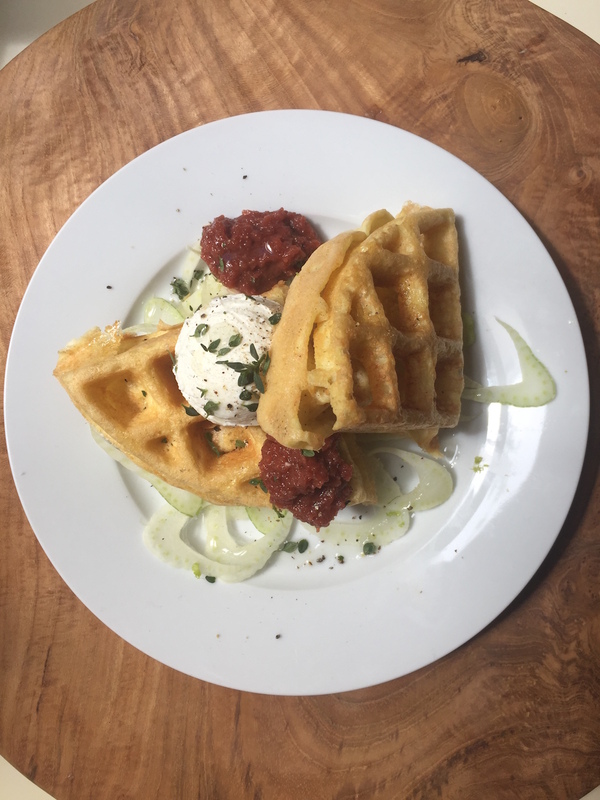 Trust me on this – you want these Keto Hazelnut Lace Waffles in your face ASAP! This time around, I had the opportunity to test out a starter recipe about which I’ve been dreaming for some time: Savory Keto Hazelnut Lace Waffles with Creme Fraiche and Caramelized Onion- Roasted Beet Jam over Shaved Fennel Salad. It was a HIT! 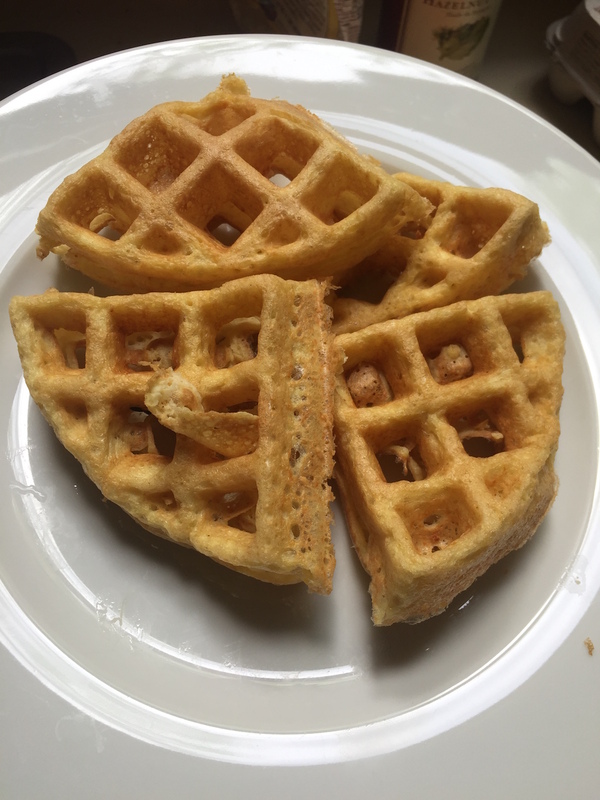 The waffles themselves, which are a riff on this Almond Flour Waffle recipe from the amazing website Low Carb Yum, are both Keto and Paleo. They also happen to be light, lacy, crispy, and SCRUMPDIDDLYUMPTIOUS! With only five ingredients, they are also super easy to make. You could serve these with a sweet syrup, melted butter, or even topped with bacon and a poached egg. However you decide to do it, any tastebuds treated are going to be impressed! 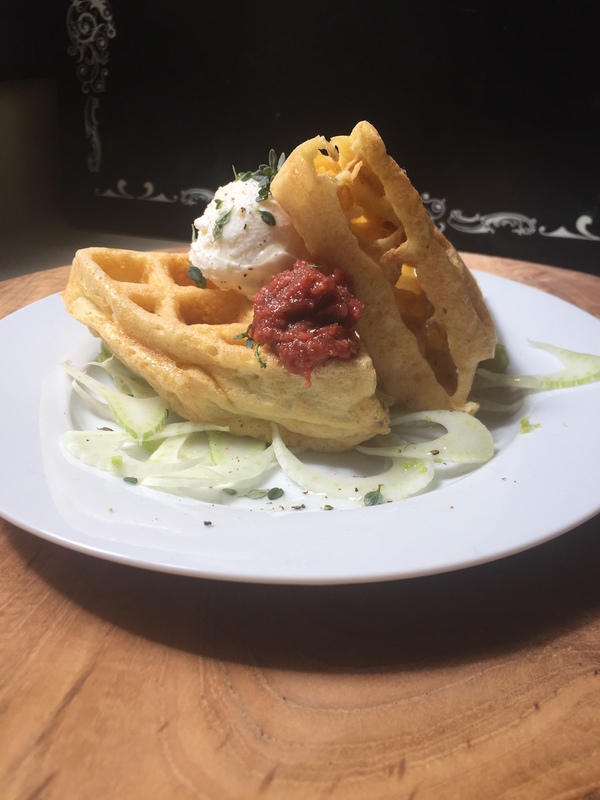 Light and lacy yet protein packed and satisfying, these crispy-fluffy waffles are designed to amaze. Try them with either sweet or savory toppings, an extra egg or low-carb chocolate sauce. You will not be disappointed, and neither will your guests! 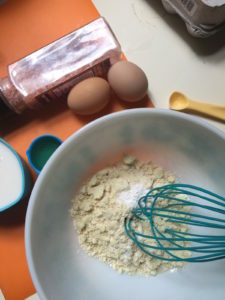 Place your dry ingredients into a medium mixing bowl and whisk to combine well. 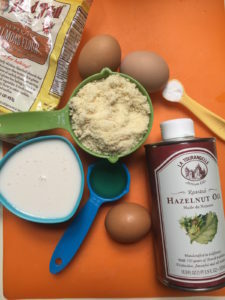 Add the eggs, oil, and almond milk and whisk again until smooth. 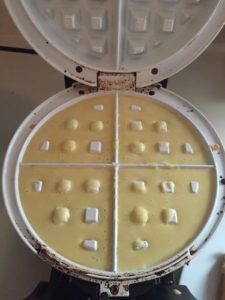 Once your waffle iron is ready, pour in the amount of batter recommended by the product instructions. For my Bialetti Belgian waffle iron, this is about ⅔ cup of batter. This will result in 3 full Belgian waffles, and half of one is a serving. Cook until the ready light comes back on. Remove gently with a fork. Repeat process until all of the batter is cooked. Serving size: 1 waffle Calories: 189.5 Fat: 16.9 Saturated fat: 2. Unsaturated fat: 5.6 Trans fat: 0 Carbohydrates: 4.6 Sugar: .9 Sodium: 106.1 Fiber: 2.2 Protein: 7.3 Cholesterol: 93. Gather your ingredients, plus salt! 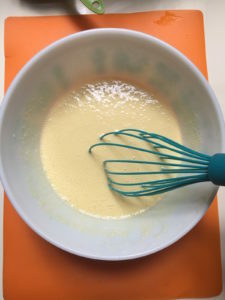 Add wet ingredients and whisk into a smooth batter. Pour batter into waffle iron and cook according to machine directions. Remove from the waffle iron and repeat process until all the batter has been used up. Garnish as desired and serve! I went with creme fraiche, caramelized onion & roasted beet jam, fresh lemon thyme, and shaved fennel salad with a little drizzle of hazelnut oil.